For a list of all known planets (including unnoted or fictional planets, like HH130782), see :Category:Planets. Planets ( kyexiin: tèÞ(Proper); SRX: teth (Proper); ) are astronomical bodies which are gravitationally bound to the barycenter of a (star) system. They are usually surrounded by natural objects of smaller size (called moons), natural (asteroids, comets) and artificial space debris which can form visible planetary rings. If two planets surrounding each other  and sharing the same barycenter, they are commonly called a binary planet. They are the birthplaces of all known civilizations, provide most materials needed for survival, and are centers of research, culture, and development. Each planet is unique, from the massively terraformed ArcCorp to the aquatic haven of Cassel. Planets, moons, and stars are formed in accreditation discs. Space debris, which is leftover of this process can be ejected extremely far away from the system's barycenter (i.e. Oort Cloud). Also, planets could be ejected from a star system are then called "Rogue planets". The ARK Starmap shows currently (as of February 2019) 21 different planet 'types', including 324 planets. Over the development, the types of some planets have changed. There is currently no indicator known on which basis these types for certain planets were chosen. The terms used by the Starmap for planets are not mutually exclusive, but for some reason, every planet has only one type. An example is Kampos: A super-earth and ocean planet, but it is only listed as a Super-Earth on the Starmap. The ARK Starmap classification also includes Dwarf and protoplanets, even if they can have the size of an asteroid. The listed types can refer to the mass, composition and unique characteristics of the planet. Some types are 'counterparts'. While sharing a common feature, they differ in other aspects. Gas Dwarfs and Gas Giants are gas planets while they are differentiated by mass. However, there is no type called Gas planet. There are anomalies in the amount and cumulation of planets per system, i.e. Gurzil and Cathcart having no planets, while Kilian has 14 planets. The Starmap doesn't define what the planet 'types' exactly are. The following definitions are based on the assumption that the terms are self-descriptive and referring to their 'real-life' equivalents. The presence of certain elements (gases constitute the atmosphere), the planet's density, an existing core (magnetosphere), the surface temperature on a planet are significant factors for the development of specific features. A carbon planet, for example, would never have large amounts of water on its surface, because supplied oxygen would instantly react with the carbon. The abundance of volatile elements (gases, and 'ices'), elements with low boiling points (i.e. helium, hydrogen). Gas planets, even if they a larger core then terrestrials showing a low density. It is the result of the high gravity of such objects. In the early phase of planet-forming, more massive planetary bodies pulling large amounts of gases into their atmosphere. Super Jupiter, its mass is larger than Jupiter and causes compacting and densification of the atmospheric gases. They constitute the borderline from gas planets to Brown Dwarfs. Puffy planet (or Hot Jupiter), the counterpart of the Super Jupiter. They are lighter than Jupiter and have a larger radius. The abundance of heavier volatiles (with freezing points above about 100 K) such as methane, carbon dioxide, water, are predominant. These elements are frozen on the surface, while under the surface they could be liquid due to various reasons, i.e. tidal heating. Ice planet: see definition above, it could refer to ice planets with up to 10 Earth masses. Terrestrials are 'Earth-like' planets with an abundance of silicates, rocks, and metals. Desert planets are planets with a planet-wide desert "biome"
Iron planet, most of his mass due to a large percentage of iron, i.e. Mercury's core contains up to 70% of its entire mass. Super-Earths have a mass higher than earth, but lower than 17 earth masses. A Mesoplanet has a diameter between 473 Km (Ceres) and 4880 Km (Mercury). Science fiction writer Asimov coined the term. Chthonian planets are the remnants of a gas planet losing its gaseous atmosphere. They are resembling terrestrial planets in many ways. Rogue Planet is a term for a planet, that doesn't orbit a nearby star. They are "free-floating" through space. The only known Rogue planet is Min I.
Synthworld is the only known Artificial planet. It is a planet which is entirely constructed by the UEE. Evaporating planet, evaporates due to this closeness to its star. Starmap lists only Virtus I. Dwarf planet: object, which is massive enough to maintain a hydrostatic equilibrium, but hasn't 'cleared his neighborhood' from other objects in the orbit. However, the criteria of 'being a planet' used by ARK Starmap could be differing from today's standards. Protoplanets are made of planetesimals (very tiny chunks in a protoplanetary disc) and can reach the size of Dwarf Planets. Protoplanets can also be remnants of a system which was once formed, such as the Dwarf Planet Ceres. 2/3 of all ARK listed planets are terrestrial, about 1/4 can be considered gas planets. The term disrupted planet refers to planets which were destroyed or 'disrupted' by another astronomical body. The following list gives a short overview of known disrupted and former planets (and natural satellites, if affected, too). Ellis XI and Odin I are listed by the ARK Starmap as asteroid clusters. Gainey is still listed as Odin Ia, while Odin I is dispersing into an asteroid field. Odin System Star System Before 26th Century Nearby Star collapsed All Planets and moons rendered uninhabitable. Moon Before 26th Century Odin I collided with another object. Since Gainey lost its former barycenter, his status as "satellite" is debatable. Intact. The Hadesians developed a 'planet-killer' weapon which they are used against themselves after a civil war broke out. The only known usage was against Hades IV. The weapon merely seperated the planet into two distinct halves. Hades IV Planet 300,000 years ago Hadesian Civil War; Hadesian weapon Planet seperated in two halves. On the ground, terrestrial vehicles, like the Ursa Rover, will allow players to conduct trade, engage in combat, and complete missions, similar to most space careers. Some lore documents (especially Short Stories) referring to content which seem to be fictionary within the SC Universe. The Lost Generation takes place on Oso II. It is a 'real' planet but the plot seems to be partially fictionary. Sesen is the setting in Dateline:Sesen. There is no indication where this planet could lie, except the fact that Sesen and two other unnamed planets orbiting a star. HL2610 and HH130782 only appearing in a commercial for the Constellation Aquila. The Krell System (with 9 planets) was promised as part of the game's crowdfunding campaign. It is home of the Kr'Thak, but is unknown to Humanity, since UEE and Kr'Thak never meet before. There are several Vanduul systems which are "military classified" and don't show any planets. The Xi'an Empire could be exceptionally large since this species is traveling to the stars long before 387 BC. 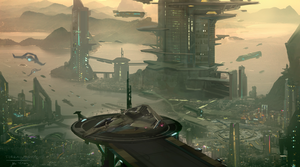 RyiXy’an was the homeworld of the Xi'an. His position is unknown. The Banu planet Queeg is only mentioned in Cassandra's Tears: A Cal Mason Adventure. Mya: Home of the 'Outsiders'. ↑ The barycenter of both planets must lie outside of both planets. ↑ Some examples include Charon V, Pyro IV were listed as Terrestrial Rocky, then reclassified as Dwarf planets, Ealus IV was listed as Gas Giant, then reclassified as a Gas Dwarf. ↑ Other objects include: Bacchus I is listed as a Super-Earth. His description says it is also a Smog planet. Corel is called a coreless, Terrestrial Rocky. The asteroid Ceres is listed in RL as a Protoplanet and a Dwarf planet. (Starmap designation: Dwarf planet.) Ceres was the first object in space who was considered to be part of a new class of astronomical bodies, called 'asteroids'. ↑ However there is another planet who are disrupted by it's sun, Charon I. However, Charon I is just listed as a Terrestrial Rocky planet. ↑ International Astronomical Union Definition, Resolution B5: (1) A planet is a celestial body that, (a) is in orbit around the Sun, (b) has sufficient mass for its self-gravity to overcome rigid body forces so that it assumes a hydrostatic equilibrium (nearly round) shape, and (c) has cleared the neighbourhood around its orbit. (2) A "dwarf planet" is a celestial body that (a) is in orbit around the Sun, (b) has sufficient mass for its self-gravity to overcome rigid body forces so that it assumes a hydrostatic equilibrium (nearly round) shape, (c) has not cleared the neighbourhood around its orbit, and (d) is not a satellite. (3) All other objects, except satellites, orbiting the Sun shall be referred to collectively as "Small Solar System Bodies".